Dónal Clancy, one of the founders of Danú and a former member of both Solas and the Eileen Ivers Band, explores the roots of Irish music in his debut solo guitar album. We are accustomed to hearing his powerful backing chords, but on this album he demonstrates as much skill as the solo melody player, treating the music with the utmost sensitivity. The guitar does not have the long solo tradition of the uilleann pipes, fiddle, flute, or accordion, but in Dónal’s hands it holds its own as a melody instrument. Only on one track is there any other backing instrument: uilleann piper David Power playing the drones on The Repeal of the Union. Otherwise the album is quiet and intimate, just Dónal and his guitar, although on some tracks he double tracks on bouzouki and bodhrán. The name of the album is very apt. The music is ‘Close to Home’ for Dónal and anyone else seeped in the tradition. Any player or avid listener of Irish music would recognize the selection of tunes. They are all familiar, commonly played tunes, ones Dónal would have heard and absorbed as a boy in the Gaeltacht of Co. Waterford. Dónal can certainly play fast modern tunes with intricate arrangements, as he has more than amply demonstrated with Solas and Danú, but here he explores the tunes themselves with subtle chords, ornamentation and variations, the heart of the tradition. Dónal wholeheartedly embraces the philosophy of the tune being the thing. He lets the tunes stand on their own, unencumbered by florid or flashy playing. If the Irish traditional music purist can accept the guitar as a legitimate melody instrument, this is the album they should acquire. And everyone who regards the guitar as primarily a backing instrument should also listen to Dónal. He more than proves that the guitar holds it own, as beautiful a melody instrument as anything more ‘traditional’. Nor do we receive the heavy dose of jigs and reels we are accustomed to hearing on Irish music albums. Dónal has several sets of jigs, slip jigs, and reels, but he carefully balances these with hornpipes, a barndance, songs, airs, a harp tune, and even a mazurka. He plays the slow airs with great sensitivity, adapting them to the strengths of his instrument. He cannot play vibrato like pipes or fiddle, but makes up for that with well placed hammer-offs, pull-ons, and triplets. At the same time, the dance tunes are lively, played with great swing and lift, and the chords he plays underneath the fingerpicked melody line are rhythmically solid. Dónal steps into the limelight and just shines. Although he has explored modern interpretations of Irish music in his work with Solas and other groups, he still retains an immense amount of respect and love for the older traditions. That is evident from this album – you can hear the love for the music in every single tune. 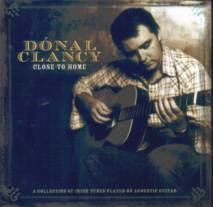 More information about Dónal can be found at www.donalclancy.com and about his label at www.compassrecords.com.